How much organic material can your car haul? I’m making the most of my vehicles. The “commuter car” I drive for my daily commute to Redmond and back is a Toyota Corolla–it takes me 20 miles each way with a little better than 36 mpg. This is great for my daily drives, and I’m very happy with it. I do have a pickup, which gets used a lot for our farm jobs. There is a challenge though. I combine as many errands as I can on my drive to and from my cubicle job, and one of these is a daily stop at our neighborhood produce stand. They save their discarded greens for me each day, and I take them home to feed the animals. 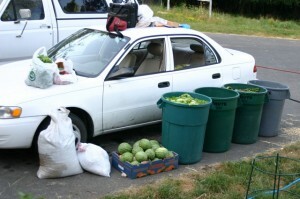 The challenge is when my little car and I show up at the market when I really needed my pickup. Monday was one of those days. The question in cases like this is: “do I go home and get the pickup, or should I see how much I can fit in my little car?” I hate to waste a trip, so usually I try to fit it in. Honey bee swarm capture equipment for 2 people (it stayed in the trunk for the photo). This only works in the summer because you must roll down both rear windows to fit 3 trash cans in the back seat. My flock of 28 geese ate all the greens & watermelons the next day. I’d like to haul this much every trip; but if I did, I would use the pickup. This post featured on Simple Lives Thursday Blog Hop. This entry was posted in Making do. Bookmark the permalink.